I don’t think it is a secret, that the Bluebells are my favourite time of year when it comes to nature. I first started noticing Bluebells when I was driving to work about 8 years ago, the woodland opposite The Henley Business School always have had a pretty display, you could see the blue in the corner of your eye driving past. As this particular display was off a very fast road and certainly not safe to park up anywhere, I would often ask my now husband if he would drive back with me at the weekend so I could jump out of the car and take some photos, while he parked up and waited (patiently). I was fascinated with them and took many photos, even before I was a Professional photographer. I first started doing Bluebell family woodland portraits, 3 years ago. We are fortunate to have a fair few woodlands in the area in and around Henley on Thames. Some you can photograph in, and some you’re not allowed (Professionally) that is. This year I think the displays have beaten previous years, they popped out earlier too, making me have kittens having penciled in nine family portraits, 2-3 weeks later on in April, so I contacted each client and we moved them all forward, to make the most of the displays. 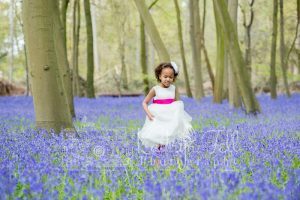 I really enjoyed all the family portraits, I never tired of seeing the woodlands (I did visit them alot over 3 weekends) It was a joy to show friends, family and clients the bluebell woods and see the look on their faces. A truly magical, peaceful place, just a dense carpet of blue. I loved that this little girl dressed up in her favourite party dress, it made the photos that more special. Here are a few more examples of some of the family portraits, above. I don’t usually go into the woods early evening as of course, all of the family portraits take place in the day at weekends. 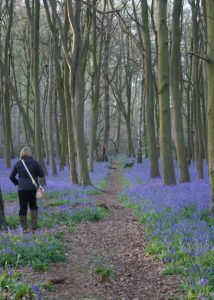 I wanted to show my good friends the Bluebell woods, so off we set. 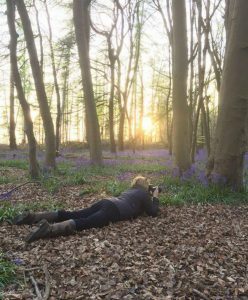 It was a beautiful evening, warm and sunny and this is a photo my friend Lorna took of me ‘getting at one with nature’. 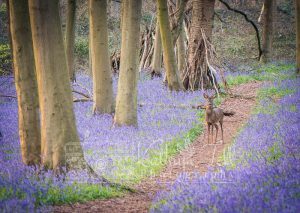 Imagine our surprise when a Deer was minding it’s own business in the Bluebell woods. Photo taken of me, by Lorna Willetts. I carried on slowly and quietly walking down the path and only had one chance to take a photo, and this was the result – photo below. I got a wonderful response by sharing this photo on my Photography Facebook page, and sent an email with photo into ITV Meridan. I was really delighted to see it featured on the local news. 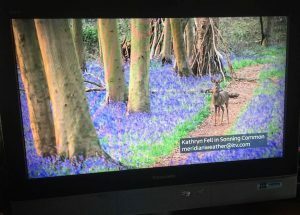 Photo of the television, of my photo of the Deer, below. 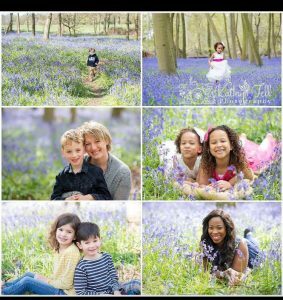 If you are interested in having a Bluebell Woodland Family portrait next year, please see my Photography Facebook page, and pop it a like, to keep up to date with news, events and to see when the ‘waiting list’ will be released. It is called a waiting list as Bluebells can come out at different times, and will depend on the weather. The past two years it has always been around mid April, and they usually stay for 10 days to 2 weeks. This year some woodlands in the South came out 1st week of April. So it is always a guessing game and watching nature like a hawk. This years display will take a lot of beating, that is for sure.